The website of the Fraternity of St Peter published notice today of the death of one of their founders, Fr. Denis Coiffet. Our condolences to his family and friends, and to all of the members of the Fraternity. “Please pray for the repose of the soul of Fr. 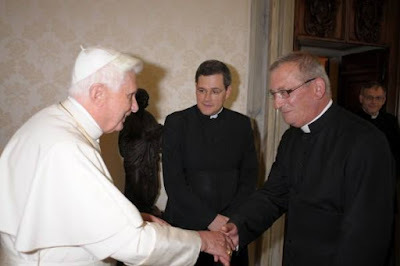 Denis Coiffet FSSP. Our confrere passed away peacefully to his eternal reward this morning at 4:50 a.m., on the feast of St. Irenaeus of Lyon, surrounded by family and accompanied by the prayers of the Church. Fr. Vianney Le Roux was at his bedside and gave him the apostolic blessing at the hour of death. Fr. Coiffet died at the end of the Litany for the Dying. The funeral mass for Fr. Denis Coiffet will be held at the Cathedral of St. Louis, Versailles at 10 a.m. on Tuesday, July 7. God, who among the Apostolic priests made Thy servant Denis flourish by priestly dignity: grant, we beseech Thee: that he may also be joined unto their perpetual society. Through Christ our Lord. Amen.